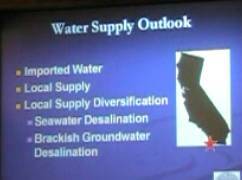 The Otay Water District and the Sweetwater Authority did presentations for the Chula Vista City Council on January 15, 2008. The theme was CONSERVATION. Imported water is not a dependable resource and we live in a coastal desert. Otay imports 100% of their water. Sweetwater has been developing local resources so that in a wet year it can provide 70-100% of its water from local sources. The drought has lowered the reservoirs considerably and they are importing 75% now. It is extremely important that people conserve water. Mark Watton, the General Manager of Otay Water District (video1), felt we would be okay in 2008, but the shortage could be critical in 2009. He explained the politics of water and why the situation is changing. He said we have relied on the Colorado River surplus for years, but there has been and extended drought and Arizona and other states are now demanding their share. 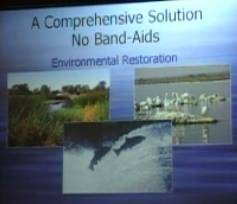 (video 2) The Delta now is less certain due to endangered species issues and the fact that other cities in the north depend upon the Delta as well. The 20-gallon challenge is important. We must conserve. This is our future. There will be difficult discussions this year, because we MUST conserve. Our future is water efficient landscaping and possible restrictions on new development. Some places are mandating these things now. He feels we are okay for 2008. Water Policy is now being made in courtrooms. The days of ignoring the environment are past. We must pay attention to the environment and seek stability in water supply. There are several bond issues that are being considered to help provide a stable, sustainable water supply. 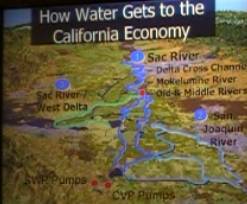 Some of the ways to fix the Delta are a decade away. A bypass canal could be in place in three years, but would not be a permanent solution. landscaping must be in our future. Otay District has been investing in Encinitas Desalinization Plant and recycled water. General Manager Dennis Bostad gave the presentation for the Sweetwater Authority (VIDEO), which supplies water to National City, Western Chula Vista, and Bonita. Sweetwater has two Reservoirs-Sweetwater and Loveland. As the population grows Sweetwater will have to depend more on imported water, but they are maximizing local resources with the desalinization plant on Second Avenue that uses reverse osmosis to make the brackish groundwater drinkable. They also have invested in the Encinitas Desalinization Plant. This shows the Colorado River Watershed, which is at 50% capacity after 12 years of drought. 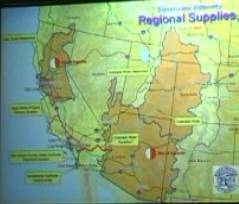 The Delta watershed on the left is also very stressed and is at 45% capacity. This is the Sweetwater River Watershed, which begins in the Cleveland National Forest. The Loveland Reservoir is at 53% capacity and the Sweetwater Reservoir is at 26% capacity. The brackish wells and the fresh water wells in National City are 100% available because they are groundwater dependent and not subject to drought. 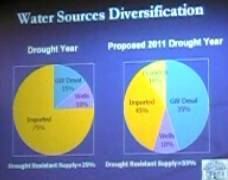 This shows the diversification of supply that Sweetwater strives for to ensure reliability. 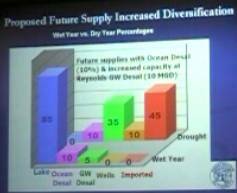 The plan is to increase GW (ground water) desalinization and add desalination from the Encinitas plant by 2011 in order to reduce reliance on imported water. The slide on the right shows the difference between where water comes from in a wet year and a dry year. The slide on the left shows brackish well exploratory locations. The Reynolds desalinization plant gets brackish water from the San Diego Formation. It has been in operation since 1999. The latest research shows that this body of brackish water is very large, and the plan is to put in more wells in order to increase the supply of brackish water that can be desalinized into potable water. 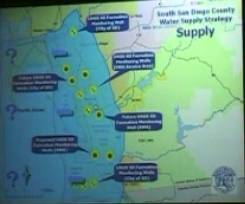 Sweetwater is partnering with Otay Water District and San Diego to better exploit this resource. They are working to find an environmentally sensitive way to dispose of the brine resulting from this process. 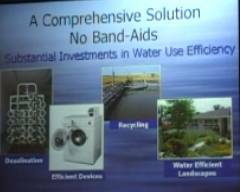 Mr. Bostad also emphasized that Water Conservation MUST become a way of life. At the end of the presentation the council members had questions and the representatives answered them (Click here for Video). In response to question about desalinization Sweetwater responded that they have been testing all the wells since they started desalinizing brackish water in 1999 and have found no overdrafts or subsidence of the ground. There was a discussion of recycled water and the value of highly treated sewage water. It was pointed out that before the Colorado River water gets to us the highly treated sewage of a number of large cities and many small cities is dumped into it. Within ten years we need to be considering using this highly treated sewage water for ground water recharge at a minimum if not direct potable uses. Sweetwater is exploring other alternatives now because it does not have the huge investment in an alternative delivery system that Otay District has (purple pipes), but it is working with cities and Otay on future development of waste water treatment and potable reuse options. Rudy Ramirez asked specifically what the city could do to help ensure water reliability. The answer given was mainly coordination. 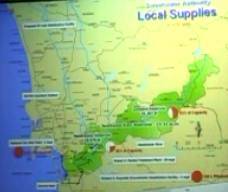 Both Districts have been involving the city in the discussion of future water supplies and CONSERVATION. It was pointed out that the political process was very important because the land use decisions made at the dais had a huge impact on the need for water. It was suggested that the city become actively involved in promoting the efficient use of water and conservation. It was mentioned that relying upon orderly development meant that the city must integrate the development of new water supplies into the political process. Coordination with water districts is absolutely critical. Mr. Watton emphasized that conditions were changing. Global Warming will affect the snow supply. We may face more drought, etc. He urged the initiation of a broad community dialogue not only locally but state wide on how we are going to deal with these changing conditions that will negatively affect the availability of potable water in the near future.